...those experiments be not only esteemed which have an immediate and present use, but those principally which are of most universal consequence for invention of other experiments, and those which give more light to the invention of causes; for the invention of the mariner's needle, which giveth the direction, is of no less benefit for navigation than the invention of the sails, which give the motion. After an orange cloud—formed as a result of a dust storm over the Sahara and caught up by air currents—reached the Philippines and settled there with rain, I understood that we are all sailing in the same boat. Anatomy is the great ocean of intelligence upon which the true physician must sail. Bacteriology is but one little harbor. In 'Advancement of Surgery', Journal of the American Medical Association (25 Feb 1893), 20, No. 8, 199. As soon as somebody demonstrates the art of flying, settlers from our species of man will not be lacking [on the moon and Jupiter]… Given ships or sails adapted to the breezes of heaven, there will be those who will not shrink from even that vast expanse. (1610) As translated by Edward Rosen in Kepler’s Conversation with Galileo’s Sidereal Messenger (1965), 39. At Gabriel College there was a very holy object on the high altar of the Oratory, covered with a black velvet cloth... At the height of the invocation the Intercessor lifted the cloth to reveal in the dimness a glass dome inside which there was something too distant to see, until he pulled a string attached to a shutter above, letting a ray of sunlight through to strike the dome exactly. Then it became clear: a little thing like a weathervane, with four sails black on one side and white on the other, began to whirl around as the light struck it. It illustrated a moral lesson, the Intercessor explained, for the black of ignorance fled from the light, whereas the wisdom of white rushed to embrace it. Fleets are not confined to the ocean, but now sail over the land. … All the power of the British Navy has not been able to prevent Zeppelins from reaching England and attacking London, the very heart of the British Empire. Navies do not protect against aerial attack. … Heavier-than-air flying machines of the aeroplane type have crossed right over the heads of armies, of million of men, armed with the most modern weapons of destruction, and have raided places in the rear. Armies do not protect against aerial war. In 'Preparedness for Aerial Defense', Addresses Before the Eleventh Annual Convention of the Navy League of the United States, Washington, D.C., April 10-13, 1916 (1916), 70. His mind illumined the Past and the Future and wrought greatly for the present. By his genius distant lands converse and men sail unafraid upon the deep. Inscription on the tomb of Reginald and Helen Fessenden in Bermuda. In Frederick Seitz, The Cosmic Inventor: Reginald Aubrey Fessenden (1866-1932) (1999), 61, being Transactions of the American Philosophical Society, Held at Philadelphia For Promoting Useful Knowledge, Vol. 86, Pt. 6. I just looked up at a fine twinkling star and thought that a voyager whom I know, now many a days’ sail from this coast, might possibly be looking up at that same star with me. The stars are the apexes of what triangles! In Henry David Thoreau and Bradford Torrey (ed. 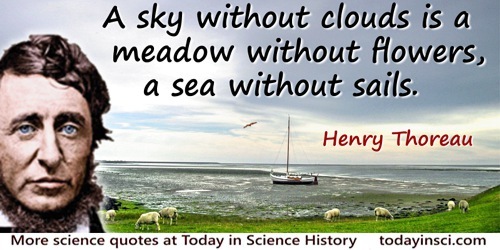 ), The Writings of Henry Thoreau: Journal: I: 1837-1846 (1906), 486. In 'The Great Infidels', The Works of Robert G. Ingersoll (1902), Vol. 3, 309. Many of the nobles and senators, although of great age, mounted more than once to the top of the highest church in Venice, in order to see sails and shipping … so far off that it was two hours before they were seen without my spy-glass …, for the effect of my instrument is such that it makes an object fifty miles off appear as large as if it were only five miles away. ... The Senate, knowing the way in which I had served it for seventeen years at Padua, ... ordered my election to the professorship for life. Quoted in Will Durant, Ariel Duran, The Age of Reason Begins (1961), 604. From Charles Singer, Studies in the History and Method of Science (1917), Vol. 1, 228. Of all the forces of nature, I should think the wind contains the largest amount of motive power—that is, power to move things. Take any given space of the earth’s surface— for instance, Illinois; and all the power exerted by all the men, and beasts, and running-water, and steam, over and upon it, shall not equal the one hundredth part of what is exerted by the blowing of the wind over and upon the same space. And yet it has not, so far in the world’s history, become proportionably valuable as a motive power. It is applied extensively, and advantageously, to sail-vessels in navigation. Add to this a few windmills, and pumps, and you have about all. 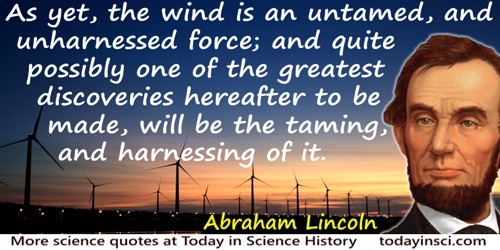 … As yet, the wind is an untamed, and unharnessed force; and quite possibly one of the greatest discoveries hereafter to be made, will be the taming, and harnessing of it. Lecture 'Discoveries and Inventions', (1860) in Discoveries and Inventions (1915). The power of man to do work—one man-power—is, in its purely physical sense, now an insignificant accomplishment, and could only again justify his existence if other sources of power failed. … Curious persons in cloisteral seclusion are experimenting with new sources of energy, which, if ever harnessed, would make coal and oil as useless as oars and sails. If they fail in their quest, or are too late, so that coal and oil, everywhere sought for, are no longer found, and the only hope of men lay in their time-honoured traps to catch the sunlight, who doubts that galley-slaves and helots would reappear in the world once more? Science and Life (1920), 6. 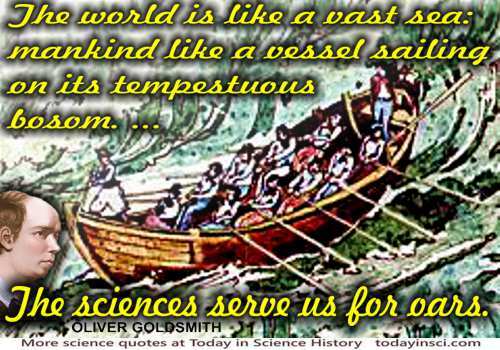 The world is like a vast sea: mankind like a vessel sailing on its tempestuous bosom. … [T]he sciences serve us for oars. From concluding paragraph, 'Letters from a Chinese Philosopher', LXXXIII, first published in journal The Public Ledger collected in The Miscellaneous Works of Oliver Goldsmith (1762, 1809), 41. Those who are enamoured of practice without science, are like the pilot who embarks in a ship without rudder or compass and who is never certain where he is going. From original Italian: “Quelli che s'innamorano della pratica senza la diligenza, ovvero scienza, per dir meglio,sono come i nocchieri, che entrano in mare sopra nave senza timone o bussola, che mai hanno certezza dove si vadano,” in Trattato Della Pittura (Treatise on Painting) (1817), Part 2, 69. Translated in Anthony Lejeune, The Concise Dictionary of Foreign Quotations (2001), 234. 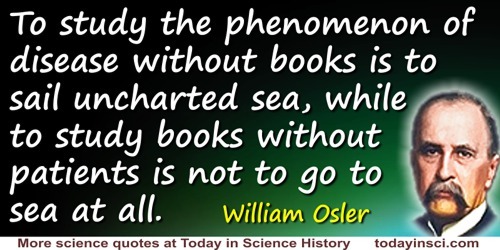 To study the phenomenon of disease without books is to sail uncharted sea, while to study books without patients is not to go to sea at all. Address for the Dedication of the New Building of the Boston Medical Library (12 Jan 1901). Printed as 'Books and Men', The Boston Medical and Surgical Journal (17 Jan 1901), 144, No. 3, 60. We set sail on this new sea because there is new knowledge to be gained, and new rights to be won, and they must be won and used for the progress of all people. For space science, like nuclear science and technology, has no conscience of its own. Whether it will become a force for good or ill depends on man, and only if the United States occupies a position of preeminence can we help decide whether this new ocean will be a sea of peace or a new terrifying theater of war. What sir, would you make a ship sail against the wind and currents by lighting a bonfire under her deck? I pray you excuse me. I have no time to listen to such nonsense. In Ashton Applewhite, Tripp Evans and Andrew Frothingham, And I Quote (1992), 172, but without definitive source. Webmaster has not found any 19th-century book with such a quotation. Contact webmaster if you can help identify if this is a valid quote or merely a joke. Ye daring ones! Ye venturers and adventurers, and whoever of you have embarked with cunning sails on unexplored seas! Ye enjoyers of enigmas! Solve unto me the enigma that I then beheld, interpret for me the vision of the loneliest one. ... O my brethren, I heard a laughter which was no human laughter.